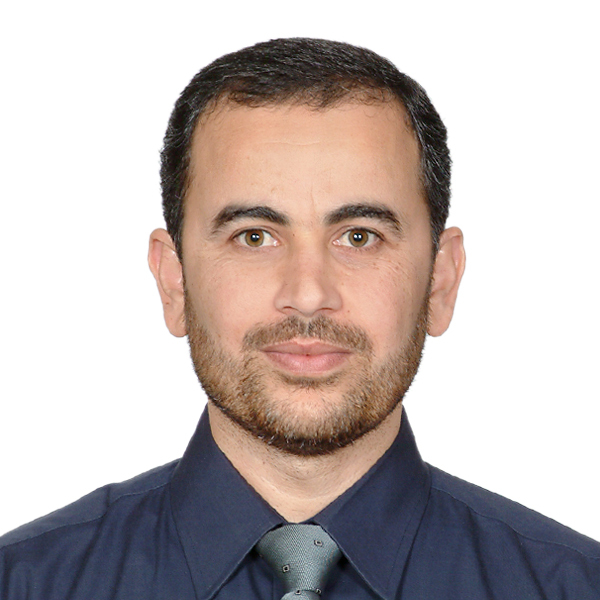 Mohammad Hayajneh (SM01, M04) received his B.Sc and M.Sc in Electrical Engineering majoring in Electronics and Communications from Jordan University of Science and Technology in 1995, 1998, respectively. He received his PhD in Electrical Engineering from University ofNew Mexico (Albuquerque, USA) in 2004. In September 2004 he joined the College of Information Technology, United Arab Emirates University (Al Ain, UAE), as an Assistant Professor with the Computer System Engineering track. Before joining the PhD program at University of New Mexico, Dr. Hayajneh held several positions in the academia: he was lecturer and head of the Telecom. Department in the Institute of Science for Telecom and Technology in Riyadh, KSA from 20002001. And from 19982000 he was an instructor at Princess Sumaya University of Technology, (PSUT) Amman, Jordan. Dr. Hayajneh research interests include: power control for wireless data networks, WiMAX cross-layer scheduling, resource allocation and pricing in wireless data networks, MIMO systems, performance analysis and modeling of OFDMA based wireless networks. M. Hayajneh and Chaouki T. Abdallah, ``Distributed Joint Rate and Power Control Game- Theoretic Algorithms for Wireless Data", IEEE Communications Letters, vol.8, no.8, pp.511-513, Aug. 2004. T. Taibi, W. Ibrahim and M. Hayajneh, ``Effect of Question Type on the Performance of Information Technology Students,"accepted for publication in the International Journal of Teaching and Case Studies (IJTCS), Oct. 2008. Mohammad Hayajneh , Issa Khalil, and Yasser Gadallah, ``An OFDMA-Based MAC Protocol for Under Water Acoustic Wireless Sensor Networks", to be presented at IEEE IWCMC'09, Leipzig, Germany, 21-24 June 2009. Mohammad Hayajneh, Issa Khalil, and Mamoun Awad, ``Non-Cooperative Uplink Power Control Game for CDMA Wireless Communications Systems", to be presented at IEEE ISCC'09, Soussa, Tounisia, 5-8 July 2009. Isaa Khalil, Mohammad Hayajneh, and Mamoun Awad, ``SVNM: Secure Verification of Neighborhood Membership in Static Multi-hop Wireless Networks",to be presented at IEEE ISCC'09, Soussa, Tounisia, 5-8 July 2009. Mohammad Hayajneh and Yasser Gadallah, ``Throughput Analysis of WiMAX Based Wireless Networks", in the proceedings of Wireless Communications and Networking Conference, 2008 (WCNC08), Las Vegas, USA, pp. 1997-2002, April 2008. Najah Abu Ali, Mohammad hayajneh and Hossam Hassanein, ``Cross-Layer Scheduling Algorithm for IEEE 802.16 Broadband Wireless Networks", in the Proceedings of IEEE International Communications Conference 2008 (IEEE ICC08), pp. 3858 - 3862, Beijing, China, May 2008. M. Hayajneh, Chaouki T. Abdallah, and W. Ibrahim, ``Impact of Fading Wireless Channel on The Performance of Game Theoretic Power Control Algorithms for CDMA Wireless Data", in the Proceedings of ACS /IEEE AICCSA08, Doha, Qatar, pp. 317 -324, March 2008. Yasser Gadallah and Mohammad Hayajneh, ``Probability Bounds of Throughput Performance of Real-Time Traffic in WiMAX Networks", in the Proceedings of the IEEE International Wireless Communications and Mobile Computing Conference (IWCMC 2008), pp. 332 - 337, Crete, Greece, August 2008. Mohammad Hayajneh, Najah A. Abu Al, and Hossam Hassanein,``Adaptive Bandwidth Provisioning in IEEE 802.16 Broadband Wireless Networks ", to appear in the proceedings of GlobeCom 2008, New Orleans, LA, USA, Nov. 2008. F. Sallabi, M. Hayajneh, W. Ibrahim, `` QoS Issues in OFDMA Based Wireless Networks," Proc. Second International Conference on Modeling, Simulation and Applied Optimization, ICMSAO 07, Abu Dhabi, UAE, March 2007, in press. M. Hayajneh, M. Costa, and Chaouki T. Abdallah, ``Exploiting Multiuser Diversity in Scheduling MIMO Cellular Systems", In the Proceedings of the 2nd IEEE International Conference on Wireless and Mobile Computing, Networking and Communications (WiMOB06) , Montreal, Canada, June 2006, pp. 362-365. W. Ibrahim, M. Hayajneh, A. Elchouemi,``The Effect of Test Correlation on VLSI Test Vectors Selection", IEEE International Design and Test Workshop IDT06}, Dubai, UAE, Nov. 2006, in press. M. S. Hayajneh and Chaouki T. Abdallah, ``Distributed Power Control Game Theoretic Algorithms For DS-CDMA Wireless Data'',in the Proceedings of IIT`04, Dubai, pp. 438-447, October 2004. M. Hayajneh and Chaouki T. Abdallah, ``Statistical Learning Theory to Evaluate The Performance of Game Theoretic Power Control Algorithms for Wireless Data in Arbitrary Channels," In the proceedings of IEEE Wireless Communications and Networking Conference 2003 (WCNC03), vol.4, no.1, New Orleans, LA, pp.723-728, Mar. 2003. M. Hayajneh and Chaouki T. Abdallah, ``Performance of Game Theoretic Power Control Algorithms In Interference Limited Wireless Fading Channels," in the proceedings of Sixth Baiona Workshop on Signal Processing in Communications, Baiona, SPAIN, Sep. 2003. M. Hayajneh and A. Scaglione ``Space-time codes for high bit rate wireless communications: asymptotic performance of space-time random codes", IEEE International Symposium on Circuits and Systems (ISCAS02), vol. 1, pp. 857 -860, Scottsdale, Arizona, May 2002. Mohammed M. Banat, Ibrahim Ghareeb, and Mohammed Hayajneh,``Power Spectrum of Hybrid Optical Modulated Signals Employed in Cellular Mobile Communication Systems ," in the proceedings of the Jordan International Electrical and Electronics Engineers Conference, Apr. 1998. Mohammad hayajneh, ``Application of Game Theory to Power and Rate Control for Wireless Data,'' Ph.D. Dissertation, ECE Department, University of New Mexico, July 2004. Mohammad Hayajneh, ``Optical Fiber Feeder for Cellular Mobile Communication Systems Employing Hybrid Modulation Scheme,'' MS Thesis, EECE Department, Jordan University of Science and Technology, January 1998. Co-PI on a Emirates Foundation grant of 200,000DH titled ``Extending Network Communications Reach to Desert and Disaster Areas, received February 2009. PI on UAEU grant of 19200 DH titled ``Throughput Analysis of WiMAX Based Wireless Networks", received March 2008. Co-PI on a UAEU grant of 15500 DH titled ``Modeling of 802.16 Throughput Performance Bounds", received March 2008. Co-PI on a UAEU grant of 20,000DH titled ``Scheduling for Point-to-Multipoint WiMax Networks", received March 2008. PI on a Emirates Foundation grant of 200,000 DH titled ``A WiMAX-based Fire Protection System", Submitted June 2008. Co-PI on a Emirates Foundation grant of 200,000 DH titled ``Water Conservation and Irrigation Control in UAE Using Wireless Sensor Networks", Submitted June 2008. PI on a National Research Foundation grant of 750,000 DH titled ``Performance Analysis of OFDMA Based Broadband Wireless Networks with Cooperative Diversity", Submitted February 2009. Graduate student King Fellowship, UNM Spring 2003. M.Sc. Scholarship, Jordan University of Science and Technology (JUST), 1995. IEEE Global Telecommunications Conference 2004, 2006,2007.